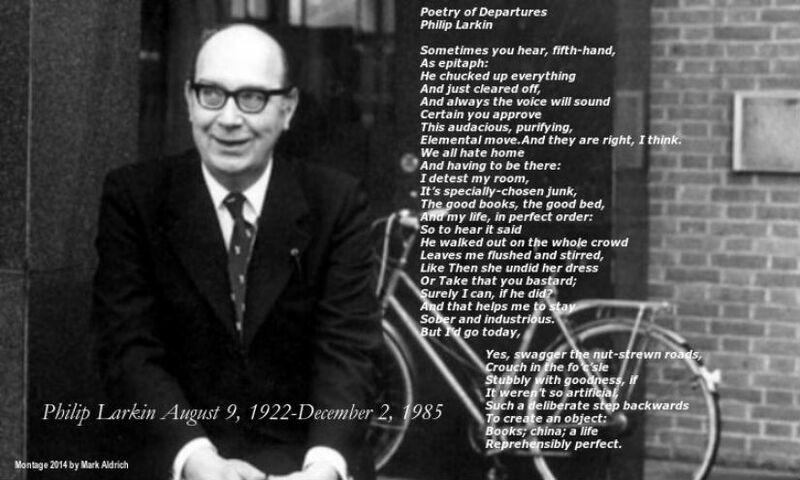 Philip Larkin (August 9, 1922–December 2, 1985), was a librarian at the University of Hull in the north of England. He was also a major poet; almost thirty years after his death, he is consistently ranked among the top ten post-war English writers. Born in Coventry, he studied at Oxford University and became best friends with Kingsley Amis; he contributed to and helped edit Amis’ first novel, “Lucky Jim,” which launched Amis on his own legendary career in literature. “Even its natives?” Perhaps it is me, but that phrase rings odd. I lived for several years far away from home and, when asked about my new neighbors, co-workers, and friends, never said about my fellow Iowans, “Even the natives” think such-and-such about Cedar Rapids. It is the phrase of someone who built nests for himself but never a home. The library grew into a world-class institution under his leadership: under him it installed the first computerized library circulation system in Europe. His reputation as a poet grew as well, although his body of work is a spare one: only a few dozen poems published in his lifetime. When he was offered the position of Poet Laureate, he declined it with his usual brutal honesty: he had not written anything in years and considered himself retired. It was an honor that he had coveted when he was writing. His reputation was negatively affected by the posthumous publication of his private letters (his diaries had been destroyed, as per his last wishes); the librarian who did not see much of the world was revealed to be someone who did not like the world very much to begin with and thus shifted ever-rightward politically. In many of the letters he is ugly and racist, and readers were shocked. How could someone who wrote plain-spoken and yet beautiful poetry also write such brutal and angry paragraphs? Perhaps as a writer of poetry meant to be read aloud, of a poetry of tone, even tone-deaf statements have a tone, need to be put down in order to be cast aside. He did not live long enough to offer an explanation, however, and racism is racism and ugly is ugly; just because I wish it had been otherwise can not make it otherwise. The poetry, his work, is plain-spoken, humorous, and often beautiful. In “Poetry of Departures,” from “The Less Deceived,” a volume published in 1955, he addresses the issue of not traveling anywhere. Of “not going anywhere by design.” The issue of why not visit, travel to, live anywhere else. Why Hull, anyway? Why live a “life / Reprehensibly perfect” by traveling the world merely to collect tchotchkes and excite onlookers when life is here anyway, no matter what one does? Let others do it. For me, I love travel and hope to finally see England, even Hull, the home of that odd man always out, Philip Larkin. The Gad About Town is on Facebook! Subscribe today. Daily facts (well, trivia) about literature and history, plus links to other writers. I always liked Philip Larkin — he was write about African Americans. They were freed from slavery but had to fight for their freedom as human beings (don’t we all?). Great info. Great dream. I hope you get there. Interesting post, beautiful poetry. Been to Cedar Rapids Iowa too (Coe). I lived there 2000 through ’04. Worked at Square D and lived in the downtown area, on First Avenue, about 15 blocks closer to the river from Coe. I have not been back there since the big flood. Wow! I had completely forgotten about the flood. Just looked at photos – what a mess. Haven’t been there since 1982. Miss the Amana Colonies. I have nominated you for the Premio Dardos Award. See my post http://www.inspiringmax.com/celebrating-ve…-dardos-awards/ for more details. Hi the above link didn’t work use http://www.inspiringmax.com/celebrating/ it should work. Sorry I think the address was too long. Philip Larkin died 30 years ago today.